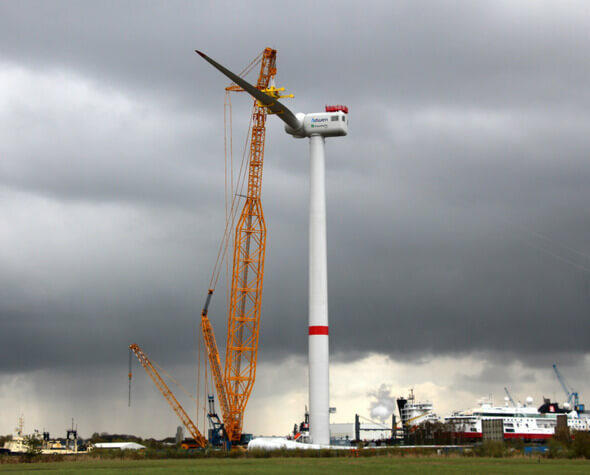 The world's most powerful wind turbine with a weight of 777 tons is currently being installed in Bremerhaven. The offshore prototype Adwen AD 8-180 has been tested and optimized for several months in the 'Dynamic Nacelle Testing Laboratory' (DyNaLab) of the Fraunhofer IWES Institute for Wind Energy and Energy System Technology, before the field trial will now follow. The turbine's size is quite enormous: the toewr has a height of 115 meters. The nacelle was installed last week. Next, the 88-meter-long rotor blades will follow. The turbine has got a total diameter of 180 meters, enough to allow two Airbus A380 planes to fly side by side, as reported by BIS Wirtschaftsförderung Bremerhaven, an economic development agency. In Bremerhaven, people are convinced of the possibilities of offshore wind energy. "If it is possible to minimize the costs of offshore wind thanks to more efficient technologies and processes, the industry will be able to fully exploit its indisputable advantages," explains Nils Schnorrenberger, Managing Director of BIS Wirtschaftsförderung Bremerhaven. In addition, the offshore industry offers opportunities for further jobs in the structurally weak region in northwest Germany. In addition to IWES, the turbine's developer, Adwen, is also located in Bremerhaven. "This is the largest rotating machine humanity has ever built," emphasizes IWES Institute Leader Prof. Dr.-Ing. Andreas Reuter. He and his team ensured that the turbine could be further improved in the past months. Although the offshore industry has already experienced strong cost reductions in recent months, the potential for further optimization is still high. As soon as the turbine has proved its competitiveness, further enlargement is no problem.